On the 5th of November, TSC organized a meeting in Brussels titled “Supply Chain Sustainability Initiatives: State of the art and a roadmap for better co-operation, harmonization and alignment”. The morning sessions focused on co-operation opportunities with leading European initiatives: Environmental Footprint (EF) of European Commission, Sustainable Agriculture Initiative (SAI), CDP and AISE’s Charter. TSC has a broader scope than all these initiatives but co-operation is important so that initiatives can learn from each other and to prevent unnecessary burden for reporting companies. Environmental Footprints are developed both for products (PEF) and organizations (OEF). PEF’s main application is communication to consumers. OEF is targeted to comparing performance over time of an organization. EF focusses on environmental issues of products/organizations in the EU. TSC includes both social and environmental issues and is globally applicable on product level. Results of a research comparing TSC and PEF were presented. For the two supply chains that were taken into account (Laundry Detergent and Dairy) both initiatives have very similar outcomes regarding hotspots. Where EF focusses completely on LCA impact indicators, TSC includes both LCA impact and more practice-based indicators. TSC is committed to adopt more PEF LCA indicators over time when the final version of the EF methodology becomes available for the respective product category, methodologies of the respective impact category is robust and data and tools are available so that the majority of suppliers can report with reasonable administrative burden. SAI focusses on farm level and the main application of their work has been through a set of about 100 activity-based indicators (Farm Sustainability Assessment). CDP started as a Carbon initiative but widens its application to water, biodiversity and the supply chain. All their indicators are on organizational level and have a focus on impact indicators. AISE’s Charter is applicable for detergents and includes both activity bases as impact indicators. TSC has been working on alignment with all three initiatives and all initiatives are committed to continue on this. 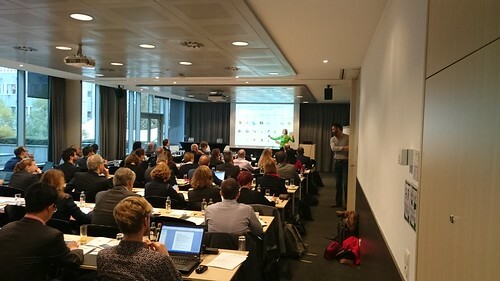 In the afternoon, the 65 participants learned about several ways TSC toolkits are implemented in Europe. The Sustainable Food Alliance, which represents all farmers, food processors, retailers and companies from catering and hospitality sector in the Netherlands, presented a proposal to apply TSC tools both on national level as with individual companies. Euan Murray presented on how TSC has been piloted by several European retailers, and updates about pilots just started in Netherlands, Spain, and Germany. SAP gave a demonstration of the available tools. Sustainability should be a mainstream practice.